P.J. Adamson is a Trinidad born professional Pannist living in Boston. His solo live performances command attention because of the many flourishes that he adds to his renditions. Panjammer has fewer embellishments and is more of a potpourri of Calypso fusion, smooth jazz/R&B rhythms, contemporary gospel and R&B vocals. 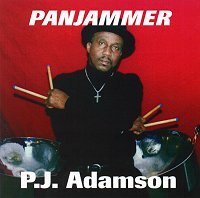 Panjammer is an eclectic Easy Listening Pan and vocals CD professionally rendered with sax, drums and bass accompaniment.